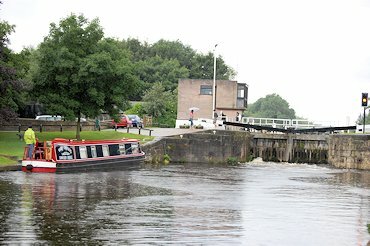 The Aire & Calder is a serious commercial waterway, yet it has substantial and growing pleasure use. It's much-loved for all sorts of other leisure activities as well - the latest is the Leeds Rowing Club - and all co-exist happily. 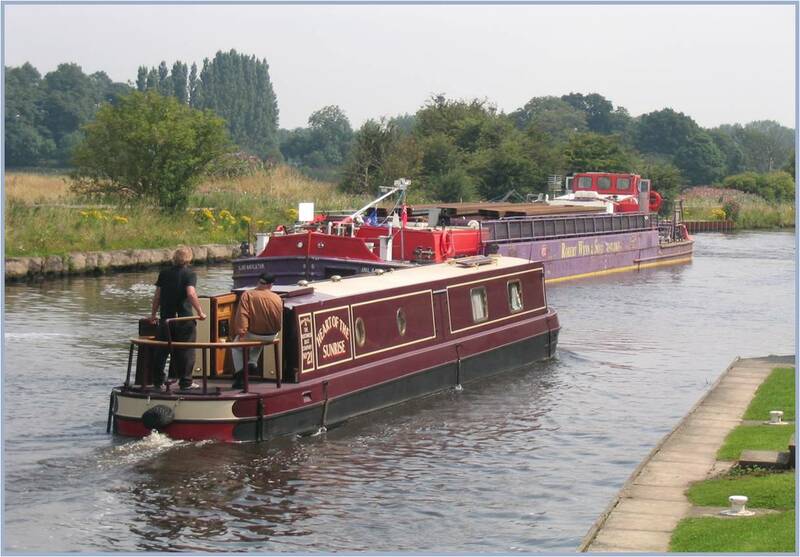 You probably first encounter the Aire & Calder at Wakefield, where the Calder & Hebble joins. At first you don't notice the difference, as you head down the river, but then you come to Broad Reach flood lock and enter the Wakefield Branch (or dyke, as it's known) - it's enormous. The canal is also dead straight here, and after a bit you come to Stanley Ferry, which has popular moorings, and a huge pub to match the canal. Just beyond are the aqueducts; the original one, an imposing iron structure like a baby Sydney Harbour Bridge, and a new, less impressive one, built in the 1980s. The big sheds on the left are the workshops in which Canal & River Trust craftsmen make all the gates for broad canals. Soon you come to Birkwood, your first giant lock. Everything works on a pushbutton, and you're quickly away, with another two locks and a motorway. After Woodnook, you're back on the river, with an aggregate unloading wharf on your right. After a big boatyard with all sorts of interesting vessels at Methley, you reach Castleford Junction, where you meet the Main Line of the Aire & Calder Navigation. You turn left for Leeds, or go straight across and through the flood lock for Goole. Head up the river, wide and with high banks. Your first lock is Lemonroyd, quite recently built to enable open-cast coal mining, since completed. 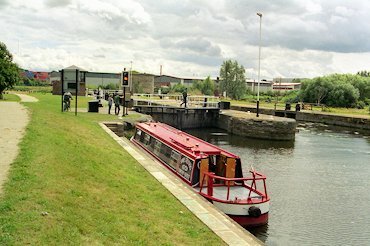 A long stretch of canal, all fast going, takes you through several locks, over a stretch of river, to Leeds Lock. Here you can turn left into the basin beside the Royal Armouries, and moor in pole position for a memorable visit - no parking charges. Back on the river, an amazing succession of restored and new buildings showing how Leeds understands its riverside opportunities. A rather small-seeming lock ahead of you is River Lock, your way onto the Leeds & Liverpool Canal. Castleford Cut, just through the flood lock, gives good moorings. It's a little walk into town, across a curved footbridge dramatically poised above the weir. Through the bridge is a busy boatyard and dry dock. 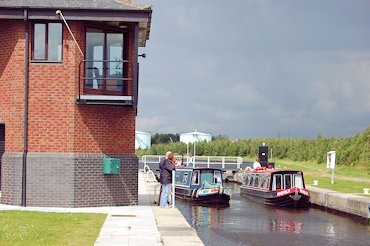 Bulhome Lock takes you down into the river, and you sail on past a nature reserve and arrive at Ferrybridge. 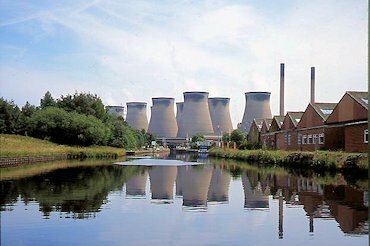 The A1 crosses on old and new bridges, and the power station still takes coal from trains, but no longer from boats. The machine ('tippler') which lifted 180-ton 'pans', turning them over to tip out the coal, still exists. This is all ex-mining country, though you have to look hard to see. At Bank Dole a little lock leads down into the Aire, meandering through farmland to West Haddlesey, the beginning of the long, straight Selby Canal. The Main Line carries on, through vast prairies and empty sky. At Great Heck there's a welcoming boat club, and after a while the New Junction Canal heads off towards the River Trent or Sheffield. The Main Line carries on, till it enters Goole. The Canal Museum and Sobriety Project (that's the name of a boat, not the state of mind of the locals) are a must-stop. Then if you keep going you find yourself in the actual port of Goole, among the freighters, and sailing beneath the hoist which used to empty the Tom Puddings which carried coal in long, snaking trains behind a steam tug. You should also see the hydraulic accumulator tower which powered it. You may by now see irate officials trying to chase you back whence you came. The Aire & Calder is a commercial navigation - which means both that it's a river navigation like the Calder & Hebble, and that it has commercial traffic. 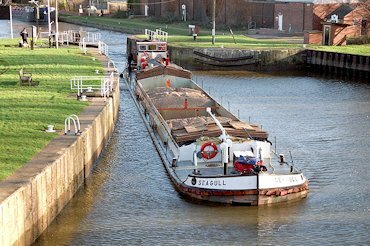 It carries gravel and oil, and in terms of ton/miles is the most important inland waterway on the Canal & River Trust network. The public benefit of canal carrying is over £1m a year, though this does not translate into cash for the Trust, as you might think it should. The Aire & Calder is bigger than the Calder & Hebble, but how you use it is just the same. What's different is the commercial traffic. Obviously, pleasure boats give way to commercial. Additionally, you should bear in mind that there are significant blind spots from the wheel of a barge, particularly when running empty, so bear in mind that if you can't see the friendly skipper, he can't see you. Sometimes a barge will need to go on the 'wrong' side, for example to take the deeper water on the outside of a bend. You should always moor to fixed bollards or rings, as a passing barge has a big draw. 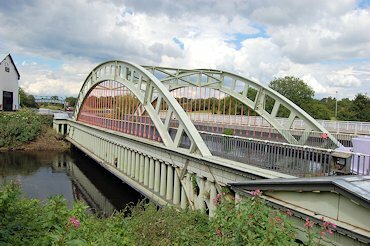 The Aire & Calder has an astonishingly long history. Tidal navigation was possible in ancient times as far as Knottingley. Navigation works were undertaken so that as early as 1699 boats reached Wakefield, and 1709 Leeds. 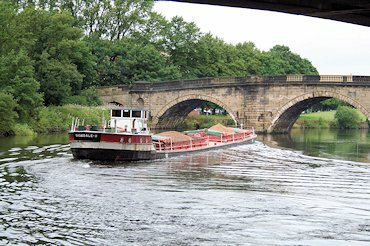 Things went on profitably till 1771, when competition from a new projected waterway from Leeds to Selby induced the proprietors to deepen the navigation to take 45 ton boats, and build a branch to meet the Ouse at Selby. This was done by 1785. 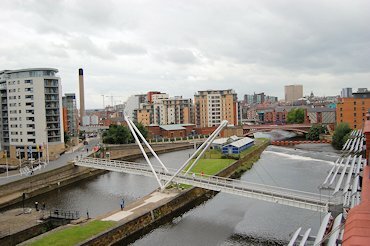 Trade grew strongly as the Rochdale, then the Leeds & Liverpool were opened. Again, by 1820 the threat of competition drove the Aire & Calder to invest, this time in building not just a port but a complete new town at Goole, with 18 miles of canal to Knottingley. Next, the line was widened and deepened (to 7') to Leeds (1835), then to Wakefield (1839), almost halving the distance from Castleford. This stretch included the spectacular aqueduct at Stanley ferry. By now, Goole Docks were too small, and were expanded. Growing railway competition bit in to the Aire & Calder's traffic, but the company fought back with steam towage. To accommodate trains of steam-hauled boats, the locks were lengthened, and the use from 1865 of compartment boats ('Tom Puddings') for coal, lifted at Goole to be emptied directly into ships, made export and coastal trade competitive with the railways. The locks were lengthened to Leeds (1873) and Wakefield (1869). The locks were improved again in the 1880s between Castleford and Goole. By 1905, the New Junction was built in joint venture with the Sheffield & South Yorkshire Navigation, opening up new traffic for the compartment boats. Then there was yet another round of lock enlargement. The First World war brought a reduction in coastwise trade, and Goole was bombed. Trade recovered in the 20s, and suffered in the second war. In 1948, the company was nationalised and Goole was stripped out. Investment continued, with the navigation enlarged to take 500 tonne barges to Leeds in 1967, and 600 tonnes in 1980 , but the decline in the Yorkshire coalfield severely affected traffic. 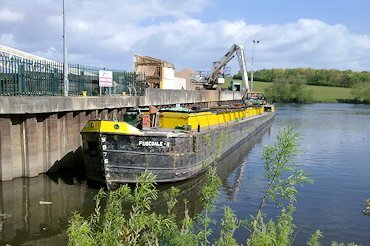 Today, some 150-200,000 tonnes are carried on the Aire & Calder Navigation; that keeps an awful lot of lorries off the roads.